Many experiences and challenges bring people to psychotherapy, from major life events to the enduring effects of childhood, past or recent experiences and difficult or stuck ways of thinking and living. These challenges can affect our relationships, our work life, our physical health and, most profoundly, our emotional wellbeing. Low mood, depression, anxiety, angry feelings, stress, loneliness, hopelessness, despair, low self-esteem, lack of confidence, social anxiety, past experiences of abuse or neglect, identity concerns, problems with intimacy and sexuality, feeling lost, unexpected life events, shock, trauma, bereavement, loss, unmanageable change and adjustment, separation, relationship challenges, parenting and caring issues, life stage challenges, wanting to find a new personal philosophy... these are just some of the many things that bring people to therapy and that can be successfully worked through. The idea of talking to a psychotherapist can be daunting and you may not be sure that it will provide what you seek. You're welcome to come to a first meeting to explore the potential benefits and consider how it might work for you with no obligation to proceed. You can also use the introductory meeting to think about the frequency of appointments and the issues that you want to address. You may just want to come for half a dozen sessions, but if you decide to work in the longer term you can keep the option to review how your therapy is working and your continuing commitment open. You may wish to meet with more than one therapist and ask about their qualifications and experience before you decide what's best for you. The benefits of these approaches include the opportunity to use the respect and trust in the therapeutic relationship to explore and understand oneself, thereby enabling change. In making the unconscious conscious we are better able to make choices and decisions about how to live our lives. Other approaches are also valid and sometimes humanistic, existential and cognitive behavioural models (among others) inform the work in therapy if they seem to be more helpful in individual cases. You may find it helpful to attend more than once a week and you can discuss this at your first appointment. You will need to think about a regular time or times each week when you can attend. The standard fee is £60 per session for individuals and £70 for couples. Fees charged for private insurance companies and other agencies may differ. Appointments last for 50 minutes unless otherwise arranged. Psychotherapy is a confidential process and a very private relationship. However, we cannot keep this contract of confidentiality if our patients or people they are directly connected with are at serious risk of harm or are committing a serious offence. Please ask if you would like more information about this aspect of our work. 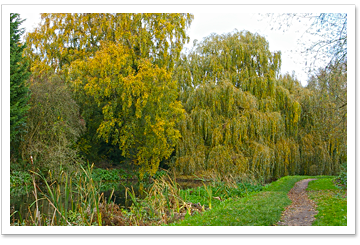 The images displayed throughout our website show the Stort Navigation which runs through Bishop's Stortford, Hertfordshire downstream to its confluence with the River Lee Navigation at Feildes Weir near Rye House, Hoddesdon, Hertfordshire.